CEE is a company in constant evolution, the research and development of new solutions and technologies allows us to always offer innovative and effective solutions. For over 40 years we have been manufacturing electromechanical and electromechanical apparatuses providing a service of assistance from the beginning of the design to the execution of functional tests laboratory tests and subsequent production. The customers we call them partners with which to start a path of shared growth to win the challenges of the market together. 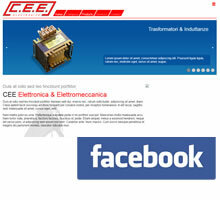 Our 360° experience starting from the creation of EMC filters and related certification issues, moving from the design and construction of transformers and inductors, reaching the development of switching power supplies, and microprocessor control electronics make us ideal candidates for the realization of a of the single components or of a complete product, always putting our competence in the neighboring sectors available.